Bretons are the human descendants of the Aldmeri-Nedic Manmer of the Merethic Era and are now the inhabitants of the province of High Rock. They are united in culture and language even though they are divided politically, for High Rock is a factious region. Bretons make up the peasantry, soldiery, and magical elite of the feudal kingdoms that compete for power. Many are capable mages with innate resistance to magicka. They are known for a proficiency in abstract thinking and unique customs. Bretons appear, by and large, much like other pale-skinned humans. They are usually slight of build and not as muscular as Nords or Redguards. Their Elvish ancestry is usually only detectable upon a closer inspection of their eyebrows, ears, or high cheekbones, though many individual Bretons appear to be more Nordic or Imperial than anything else. The great diversity in their appearance is to be expected from their politically fractured society, though their clothes, accents, customs and names are fairly uniform. There is evidence of human settlements in High Rock dating back at least a thousand years before recorded history. Before or soon after the start of the First Era, Aldmer came to High Rock from the Summerset Isles and intermarried with Nedes, eventually creating the Breton race. Sometimes there was conflict, but also long periods of coexistence in a multiracial society. While the Aldmer maintained control of Tamriel, the Manmer lived as lower-class citizens, supporting their Elven brethren. Notably, this subservience and general harmony meant they were spared during the Night of Tears. The Skyrim Conquests brought much of High Rock under the control of the Nords around 1E 246, though they would lose control around 1E 369 as a result of Skyrim's War of Succession. They apparently never controlled Wayrest, which likely wasn't founded until several hundred years later. Around the same time, the Alessian Order would make campaigns against the Direnni, weakening them enough for the locals to rebel against them. 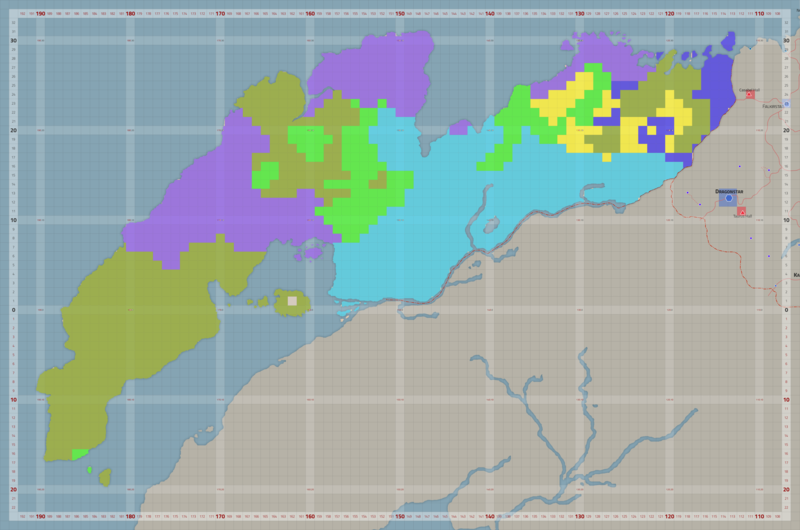 Most of High Rock would be free from Elven control by 1E 500, though they would remain in the province for most of the First Era. Other historical enemies of Bretons, besides each other, include Orcs and various supernatural creatures that roam High Rock. Over time, the emerging Bretons absorbed the remaining Nordic and Imperial population in High Rock, and the land would be definitively Breton by the end of the First Era. Tiber Septim's Empire would later easily conquer the squabbling kingdoms that emerged during the Interregnum, but would find it impossible to truly squash the sectarian conflicts between them that hampered trade and prosperity. Since most Emperors in the Third Era were Bretons or had spent their youth in High Rock, Bretons were generally supportive of Imperial rule, but were often disgruntled by its inefficacy at protecting them from violent conflicts. 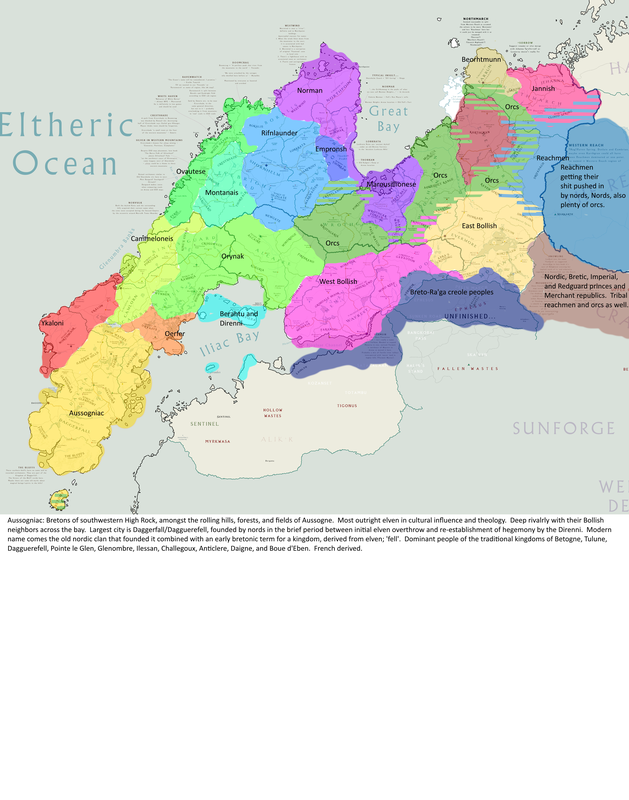 It wasn't until the Miracle of Peace that the problem would at least be reduced: the roughly two dozen fiefdoms dotting southern High Rock (where the great majority of the people are located), were united into three kingdoms: Daggerfall, Wayrest, and Orsinium. The word most often used to describe Breton villages is "quaint". Most people in High Rock live in small cottages; only the nobility and their servants stay in large castles. Many villages are still surrounded by high walls and fortresses dot the landscape, despite efforts under Tiber Septim to demilitarize the area and create prosperity by demolishing such restrictions on trade. The Bretons' largely agrarian and hierarchical society is feudal in nature. Most Breton cities are sprawling trade hubs, and most of the people are either middle-class peasants or destitute beggars. The jockeying for power amongst the various monarchs and powers of the Iliac Bay region is a deeply ingrained, even cherished, part of Breton culture. Though they have several paths to prosperity, becoming a nobleman by performing quests and services to curry favor with various rulers is considered the best way, which has created a cultural "quest obsession" amongst young Bretons. The desire to find some great opportunity for fortune and glory has made Bretons venture all over northern Tamriel, even to such remote locations as Thirsk on the island of Solstheim, where one adventurous Breton once earned the position of chieftain. Many use their magical talents to earn success. They're often considered a friendly and humorous people, though there is little love lost between many Bretons and Redguards following the vicious War of Betony. Bretons are not disposed to "excessive religion", but most accepted the Aldmeri pantheon of gods while under Elven rule, then made the transition to the Eight and Nine Divines. The most notable spirits traditionally worshipped by Bretons are Akatosh, Magnus, Y'ffre, Dibella, Arkay, Zenithar, Mara, Stendarr, Kynareth, Julianos, and Phynaster. They also recognize Sheor, the Bad Man, believed to have been introduced by the Elves during their conflicts with the Nords as a demonized version of Shor. Bretons are a tall, dark-haired people. Bretons are highly intelligent and willful people, and have an outgoing personality. It is said that Bretons are weaned on magic, for it seems to suffuse their very being. As a result Bretons take half damage on any Magic based attack, and no damage on a successful save. They are excellent in all the arcane arts. Bretons are good magical characters, more interested in using magic for their own personal use than hurting others. Their bonuses are entirely in the school of magic, so it makes sense that you'd get some extra magicka to work with. You might also consider backing your Breton up with a magicka enhancing sign for a further Magicka boost, particularly if you plan of focussing mostly or entirely on magic for dealing with enemies. Another nice bonus is the magic resistance. Quite the opposite from the almost-berserker mindset the Altmer have toward magic, a 50% magic resistance can make many negative effects seem much more manageable. It is worth knowing that there are relatively few enemies using genuinely dangerous Magicka spells, Vampires being a notable exception, so an innate Resist Magicka Ability is not as exciting as it may initially seem as it does not protect at all against all those powerful elemental spells. However, it is a significant boost towards getting a 100% Resistance to Magicka which can be helpful in a variety of ways, from wearing the Boots of Blinding Speed without penalty right up to shrugging off annoying Bonewalker attacks. Unfortunately, the Bretons have no offensive skill bonuses to speak of. It should be borne in mind however that racial Skill bonuses are usually only slight, being a matter of 5 or 10 points, and they make no significant difference in the long run. So even though, for example, a Breton may not have a Destruction bonus, it would not take long to make up that difference even through natural skill-raising. Possibly in the early stages of the game you may want to support your magic with some non-magical method of damage, perhaps using your magic to enhance yourself or hinder your enemy rather than damaging them directly. Using Conjuration to have your summoned creatures fight for you is another way to get around the non-offensive magic. In addition to their quick and perceptive grasp of spellcraft, even the humblest of Bretons can boast a resistance to magical energies. They are particularly skilled at summoning and healing magic. Bretons are particularly skilled in Mysticism, Restoration and Conjuration, which means they are natural defensive mages. They are resistant to magic making them exceptionally useful against other magic users. Attention to Alteration might be useful against enemies who fight Hand To Hand or with weapons. It should be noted that Bretons do not have any bonuses to Destruction magic, giving the player a fairer choice between using offensive magic or weapons. Although they are not as skilled as the Altmer (High Elves) in the arcane arts, they may prove useful if fighting other mages. Enemy Bretons will most frequently be encountered as Conjurers (including Conjurer Adepts) and Necromancers (including Necromancer Adepts) in Cyrodiil, as well as Heretics and Zealots in the Shivering Isles. All Bandit Hedge Wizards are also Bretons. Among the vampires, the Agents, Mages, and Spellswords are Bretons. All of these Breton wizards generally dress in robes (sometimes enchanted) rather than armor, and attack their opponents with lightweight weapons (daggers, shortswords, or maces) or Staves. Bretons are particularly skilled in Conjuration, which means that they can summon creatures and weapons to aid them in battle. They are resistant to magic making them exceptionally useful against other magic users. Many Court Wizards are Bretons. Numerous Bretons are members of the College of Winterhold. Bretons are especially common throughout The Reach. They frequently make appearances in a variety of roles, from traders to battlemages. Bumping this to get some attention. Dividing the larger Breton 'meta-culture' into subcultures should be high priority for us as a first step. This should be treated separately from city cultures, which have already been taking shape but as rural cultures for the hamlets and villages that pay the cities little mind. That said the cities should be similar to the places they rule in, having parallels atleast. I'd like to hear some ideas of how that could look like. Lets try to hammer out these soon, it has potential be a good backbone for additional concepts and is necessary for figuring out High Rock is about. As far as my own proposal - Taking a page from Roman Gaul, I see two main cultural groups of Bretons: Heir'ach Provincia, and Heir'ach Comata. I think what we might end up doing is making 3 cultures, one being very much like your Provincia culture and the other being a split between the North/Worthgarians and the East. The concept arts and descriptions are really useful though and are along the lines of what others on discord are thinking. As for the High Rock is Cool project, I think the writings can be pretty inspiring and a good level of detail to aim for. That being said its likely most of HR427's lore may go a different direction than some of these proposals, we'll have to see what fits.